The world's best selling accent and pronunciation book. This book starts at the most basic level -- the syllable -- and builds up to the complex intonation that is used in everyday English. This book will guide you to fluency in spoken American English. All aspects of the American accent are covered in detail -- intonation, liaisons and pronunciation. This book and audio compact disc program instructs students of English as a second language in the elements of grammar, presenting a grammar review that emphasizes speech and correct pronunciation. The compact discs include spoken dictations for each of the book's ten chapters. Students start by writing out what they hear, and then comparing what they have written with the book's printed version. In the process, they begin learning the elements of grammar, staring with the simple present tense of the verb "to be" and progressing to all other tenses and parts of speech. Students gradually learn how to use English words and pronounce them properly in grammatically correct sentences. Following each chapter's introductory sentence, they are given a brief story. A short test at the end of each chapter helps them determine their learning progress. The dictations start out quite simple and become progressively more difficult from one chapter to the next. The book is filled with charts and illustrations to facilitate students' learning progress. Choice Words, Phrases, Sentences, and Paragraphs for Every Situation. This book comes highly recommended by people who have a good grasp of English, but would like pre-qualified passages to use in their own writing. Don't be a fish out of water! When opportunity comes knocking, grab the bull by the horns and get down to brass tacks. Idioms are the spice of life! Unlike other vocabulary books, Verbal Advantage provides a complete learning experience, with clear explanations of meanings, word histories, usages, pronunciation, and more. Fluent English is the ideal course for developing native-like fluency in English. It's a mastery of those tricky idioms and phrases that are so common in English. And learning these idioms and phrases will not only help you speak better, it'll help you understand Americans better! pronunciation dictionary, teaches the sounds of the alphabet in a logical and clear manner. Vowels, consonants, digraphs, blends and silent letters are presented with simplicity. A full description of the mouth formation, with word examples, is given for each sound. Practice sentences are included for reinforcement. This English-learning material is aimed at beginning-to intermediate students, but it can benefit all who wish to improve their speaking abilities. In a group setting (a class), among friends or through self-study, ABC Pronunciary provides the tools for learning effective communication. This is a hilarious compilation of typical American humor. It was recorded in front of a live audience, so you get the benefit of knowing when to laugh. There are hundreds of classic jokes on every subject, delivered with sparkling wit and perfect timing. You will hear old jokes, new jokes, knock-knock jokes, lightbulb jokes, drunk jokes, men vs women jokes, man-walks-into-a- bar jokes, Lena & Ollie jokes, and loads more. Highly recommended to work on understanding fluent American speech and humor. Order the comprehensive AAT online training with pre- and post-training voice rec testing, and receive the AAT book and 5-CD set FREE! Online access is emailed immediately, and the book/CD set is shipped to you. Online training lets you study 24/7, an you can pick up the accent quickly and easily. This is particularly useful if you are studying for the TSE or TOEFL tests, or have a particular presentation with an upcoming deadline. All you need is standard equipment – a PC with Explorer 6 and headset w/mic for listening and recording. Links for Java and Flash are included in the set up. A comprehensive guide and workbook for improving ESL/EFL students' understanding of English articles, The Article Book can be used as either a supplement to any ESL/EFL core text or as a self-study tool for intermediate through advanced learners. Cole involves students in "learning by doing" through an integrated approach to skill acquisition that includes other grammar structures, reading, vocabulary, and speaking. 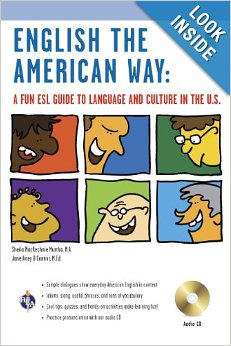 ENGLISH THE AMERICAN WAY: A FUN ESL GUIDE TO LANGUAGE AND CULTURE IN THE U.S. If you’re looking for a fun and easy way to improve your English language skills, this is the book for you! LEARN ENGLISH FROM THE EXPERTS Written by experienced ESL instructors, this handy guidebook was designed for people who already have a basic grasp of English, but want to improve how they speak the language as it is spoken in the United States. Individual units cover topics in American life: making friends, basic skills, driving, dining out, dealing with money, home life, emergency situations, doctor visits, handling a job interview, and more. Hundreds of phrases and vocabulary terms build your understanding of everyday English. Our audio CD includes the book’s sample dialogues to help you practice your vocabulary and pronunciation skills. Download additional reading and pronunciation pointers to your portable music player and practice wherever you go! Developed by acclaimed speech consultant and accent specialist Susan Cameron, Perfecting Your English Pronunciation features her successful method, which focuses on the anatomical placement of sound and on the musculature used in articulation. Where other accent reduction/English pronunciation products rely on solely mimicking of audio sounds, this work focuses visually, audibly, and narratively on the physical ability to speak English, noting that many sounds of English may be difficult for you because some tongue positions used in English may not be used in your native language. The 45-minute DVD introduces you to mouth and jaw exercises to prepare you for English, then demonstrates mouth formations and tongue placement using other nonnative speakers like you. You will see and hear how English sounds--enabling you to become more and more comfortable conversing with native English speakers as you go through the program. Lessons addressing the entire sound system of American English introduce each of the speech elements in a logical sequence. These elements are: the voice and timing patterns of intonation, stress, and rhythm, and each of the individual speech sounds. The vowels are trained early in the course, because they are generally challenging sounds, and they are key to mastering intonation stress and rhythm. Each consonant is practiced in all its variations and in all contexts and all combinations with other consonants. Focus is given to articulation at word endings, especially those that involve grammar. Lessons build upon previous lessons, resulting in new skills building upon newly trained skills. The learner gains a wealth of insights while training entire new speech patterns. Clear and articulate male and female speech models guide and engage the learner in a variety interactive exercises using everyday language that include many idioms. Lessons progress from the word level to verbal exchanges to presentation length materials. In addition to more fluent, articulate speech, the learner attains better comprehension of the language as spoken, improved grammar, and better understanding of the American culture. Now in its second edition, this program is a complete resource for the individuals who use it for self-study as well as for accent coaches, and instructors at colleges and universities. Speak and write English as if it were your native tongue! Are you tired of making the same mistakes in English again and again? End the bad habits that can leave the people you talk to confused. Correct Your English Errors warns you of hundreds of typical errors learners make and explains the reasons behind the mistakes, so you can correct yourself in the future. Correct Your English Errors offers exercises covering all parts of grammar and provides review passages to check that you are error-free. Soon, biting your nails will be your only bad habit! Speak Business English Like an American is the bestselling book & audio CD set designed to help you succeed on the job -- whatever you're doing, wherever you're working. The set is great for self-study, with dozens of helpful exercises to reinforce the material. It's also a wonderful supplemental text that's in use in universities across the USA. American English speakers use many phrases and expressions on the job. If you don't know these expressions, you are left out of the conversation. This book & CD will help you speak business English like an American ... quickly and confidently. Once you have the knack, no one can take it away from you. With this book and CD, your career will benefit for years to come. You will learn the idioms & expressions that you hear at work. What do your colleagues and coworkers, your customers or clients really mean? How can you use these expressions too? As a new speaker of English, you may hear some expressions in your daily conversations that you do not understand--yet. McGraw-Hill's Conversational American English will help you learn these expressions, so not only do you know what a person is saying to you, but that you can use the expression yourself! More than 3,000 expressions are organized by theme, so you can find what you are looking for quickly. And each topic is illustrated to further help you understand context. This book, now in its revised second edition, was written primarily for ESL students. However, it's also useful in remedial English courses presented on high school and college freshman levels. Students of English as a second language quickly discover that English is unlike their native tongue in the many ways it uses prepositions. The majority of other languages have relatively few prepositions, each of them serving many different communication purposes. English is different in that it has dozens of prepositions, none having exact equivalents in other languages. This book offers practical guidelines for correct preposition usage, and provides hundreds of examples that incorporate English prepositions into familiar contexts. The author examines more than 60 prepositions. Even though you know the vocabulary and the endless grammar rules, you still find it difficult to pronounce English words correctly. This struggle with your new language can make communicating with native English speakers a frustrating experience for both you and them. Now you can gain confidence in your English skills and speak like an American with this focused, nonintimidating program. Improve Your English: English in Everyday Life combines the video advantages of DVDs with the educational benefits of fluent American English speakers in unscripted interviews. You will benefit from hearing real people--men and women from various regions and backgrounds--having spontaneous conversations about themselves and their daily lives. The DVD also has a transcript and workbook designed to refine your listening and speaking skills. 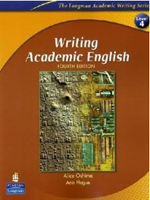 Now in its fourth edition, Writing Academic English , by Alice Oshima and Ann Hogue, is the essential writing text to prepare high-intermediate and advanced college or college-bound English language learners for academic success. A step-by-step approach guides students through the process of writing paragraphs and essays. Clear models and varied practice help students to develop confidence and a mature writing style. Examples with academic content prime students for college work. Appendices offer easy reference for key writing, grammar, and research information.